I should give credit to DeathsAdvocate who was the first player that I saw employing this strategy, someone else may have done it first but I got the idea from him. And it’s a pretty solid idea too, there’s a couple of very solid units that have rules text that is intended as a drawback to balance the card, but if you dispel that away you can be getting a pretty good deal sometimes. And that’s pretty much the deck, combine the best of these with the best aoe dispel, add some utility and hey presto! 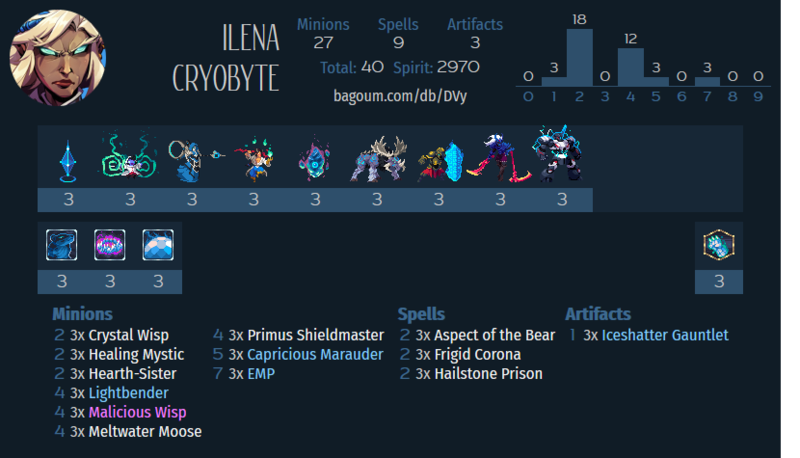 This deck can be run equally well with Faie, but shes off on aggro duty for my lineup, so it makes sense to have Ilena here to add some control elements to the deck. You’d ideally open with Crystal Wisp as the deck definitely wants to hit 4/5 mana right away, you don’t have to but your early game is a bit weak with this setup otherwise. As I said in the introduction the gameplan is pretty straightforward, play a minion, dispel the drawback, and then start hitting them. There’s a decent removal suite to supplement the deck, all of it on the cheaper end to allow you to be playing alongside your own proactive gameplan. Your main threat is large single targets, so if they have a lot of good removal it can be a problem, though your threats are usually somewhat undercosted they also rely on a limited amount of dispel to be properly effective which does not come freely either. But if you big boys get rolling you can properly smash a game. These are our main dispel targets, all having some drawback that can be dispelled off of them to reap only the benefits. Marauder and Moose are fairly straightforward stat sticks, Marauder will switch side if you’re not careful and Moose will skip a turn, but these can both be deployed to start bashing your opponents skull in if you dispel them. Be careful with Marauder the turn you play it, it’s best played onto an empty board. Malicious Wisp is a little different in that it’s not primarily a beat stick, but instead is a disruption tool. If they do not answer it immediately then dispelling it with make its mana theft a permanent fixture then you can happily throw it into the fray as a 4/3 body. These our our dispel tools, play them after the above creatures to remove their drawbacks. The bodies that these provide themselves are also good enough to be going on with, though they are a little bit under the curve the benefits from their targets being dispelled is greater, so you still come out ahead. To add onto that these are just great creatures that see play in their own right to dispel enemy units, so they can pull double duty in that regard. Small honorable mention to Aspect of the Bear as you can sometimes target your own Wisp or such with this to dodge the Dying Wish, then if you do hit your own minion with this for whatever reason then it also has a dispellable drawback that may in some occasions be useful to use to your advantage. Other than that it’s a decent removal to transform an enemy unit into a Bear, you will often have large units to one shot it. Alongside Aspect we have a few other removal tools, Corona & Gauntlets to make use of Ilena, it’s honestly a pretty good way of dealing with the enemy large units so that your get free reign. Hailstone is similar but makes them respend the mana. Between these 4 you have decent ways to deal with most threats outside of swarms. If you feel like you need more or different removal then consider adding Chromatic Cold. I hesitate to call this a two drop package, as they’re all doing different things and don’t really work in concert at all. Wisp gets us to our big minions a bit sooner, and can let us reach enough mana to be casting dispel and removal at the same to to be answering enemy boards while activating our own threats. Mystic is a superb Basic card that should keep us our our minions in the game longer. Hearth Sister is excellent to add utility to our large threats or bring enemies close for Iceshatter, and while it lacks if you have to use it as your opening play the options it brings later are very much superb. You could run an extra 2 drop if you like. I find myself adding this to a lot of my budget decks as it’s very much a solid all-rounder and costs no spirit. It’s just a fine card, but it isn’t inherently synergistic with the deck, so if you want to make changes to the deck then you could easily start here. You should look to DeathsAdvocate’s list here: https://duelspot.com/deck/tempo-faie/ which is not too much more expensive anyway.